Beautiful custom rambler on 1.4 acres on popular Lexington Place. Features a dramatic entry into a vaulted living room, fully appointed kitched with breakfast bar, with tile and hardwood flooring. Huge master bedroom sutie with 4 piece master bath, including big walk-in closet, spacious utility room, hardplank exterior, and a large finished dowble garage. Easy access to Shelton and HWY 101. This home was listed by JC Nowacki of RE/Max. Richard Beckman was the buyer's agent. 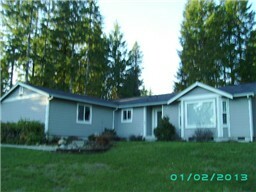 This home was sold for $205,000.00.